Born on 17th of April,1963 in Tbilisi, Georgia. In 1985 graduated from Tbilisi State Academy of Fine Arts with highest honours. At present works as a professional mentor in the Fashion Design Department of Tbilisi State Academy of Fine Arts and as designer for the Advertising Agencies. Works for modern Art Gallery. Employs many painting techniques, such as oil, watercolor, pastel, but specialized in monoprint for much of early career. Now grown into a new technique using layered printer’s inks on the paper. Paintings reside in private collections in Europe and United States. 2001 Artist in residence in Badlands National Park. 2001 Guest artist at Grand Teton National Park. 2001 Graphic design of Exhibition History, Style, Costume. Georgian Arts and Culture Center. 2001 Conducted the workshop in Tbilisi for the American artists. 2000 Took part in internet program ONEWORLDJOURNEYS.COM. New Media Invasion Award Gold medals for storytelling most extend. 2000 Artist in residence in Rocky Mountain National Park. 1998 – Workshop in Coupeville Arts Center, Whidbey Island, Washington, USA. 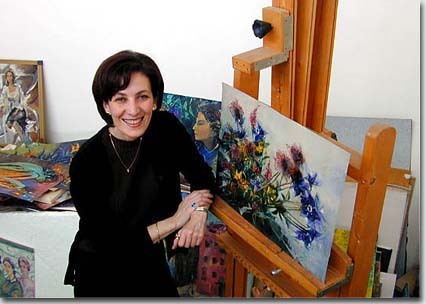 1997 – Georgia TV studious Art designer. 1996 – Workshop in Coupeville Arts Center, Whidbey Island, Washington, USA. 1990 – Production and Costume Designer for the film "The Falcon", a collaborative project between Palmer-Fenster Productions of Seattle, Washington, USA and Georgia Telefilm. Production and Costume Designer of the film "Kartuli", Georgia Telefilm. Designed books, posters, and calendars for Merani, Ganatleba, and Khelovneba Publishing Houses in Tbilisi, Georgia. Art Director and Designer for the various magazines. 1985 – Member of the Artists Union in Georgia. 1986 – Member of Professional Union of the Designers in Georgia.